Average income among households in the lowest quintile (or fifth) of the income distribution was about $19,000. Furthermore, within the highest quintile, income was highly skewed toward the very top of the distribution: Average income among households in the bottom half of the highest quintile (the 81st to 90th percentiles) was about $151,000; average income among the 1.2 million households in the top 1 percent of the distribution was about $1.8 million. 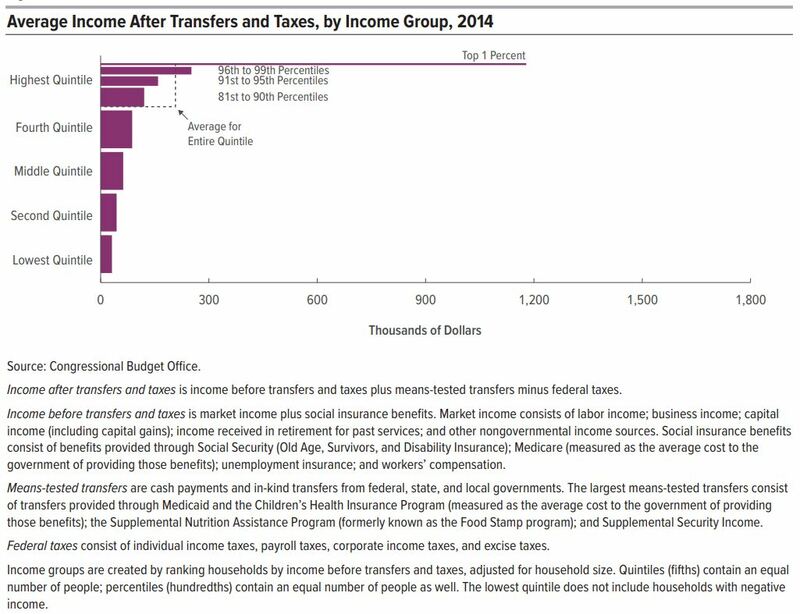 Those amounts include social insurance benefits (such as benefits from Social Security and Medicare) but exclude the effects of governmental policies that directly affect the distribution of household income either through means-tested transfer programs or through the federal tax system. Increased income among households in the lowest quintile by $12,000 (or more than 60 percent), on average, to $31,000. Decreased income among households in the highest quintile by $74,000 (or more than 25 percent), on average, to $207,000. CBO has analyzed the distribution of household income and federal taxes on a recurring basis for more than 30 years. For this report, the agency focused on the distribution of household income in 2014 because that is the most recent year for which relevant data were available when the analysis began. In addition, CBO assessed trends in household income, means-tested transfers, federal taxes, and income inequality over a 36-year period, beginning in 1979 and ending in 2014.